In a free, public lecture, Juliana “Jewels” Smith will discuss (H)afrocentric, her comic series featuring four disgruntled undergrads of color and their adventures at Ronald Reagan University. In 2016, Smith took home the 2016 Glyph Award for Best Writer for her independent four volume series. She was also honored by the African American Library and Museum of Oakland with the first annual Excellence in Comics and Graphic Novels Award. She created (H)afrocentric as a way to challenge students and readers alike about the presumptions around race, class, gender and sexuality through character dialogue. 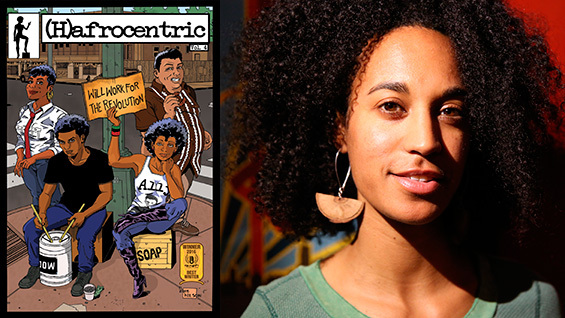 She has given talks about the relationship between comics, humor, racial justice, and gender equity at The Schomburg Center, New York Comic Con, Studio Museum of Harlem and more.